July 03, 2013, 2:49 p.m.
(Week of 6/29/2013) Americans still distrust the National Security Agency’s honesty, and disapprove of its collection of metadata about phone conversations, but their opinion of the man who leaked that information, the NSA contract employee Edward Snowden, has changed for the worse in the latest Economist/YouGov Poll. Snowden spent the last week in a transit facility at the Moscow Airport after the U.S. revoked his passport, attempting to find a country that would grant him asylum. In that time, public opinion, which up until last week had been evenly divided, has now turned negative. 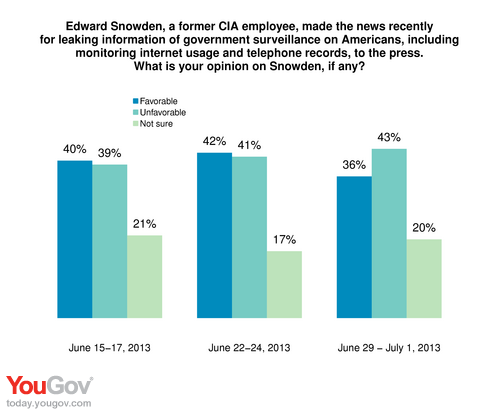 43% have an unfavorable view of Snowden now, while just 36% remain favorably. Those under 45 are still closely divided. Among senior citizens just 31% are favorable, while 57% are not. Both Republicans and Democrats hold negative views of Snowden, while independents are narrowly positive. 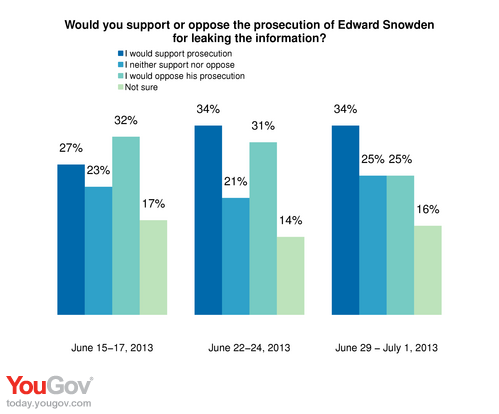 What may be more concerning for Snowden is the growth in support for his prosecution. Two weeks ago, opinion leaned towards notprosecuting Snowden for revealing government secrets. Last week, Americans were closely split (although Republicans, who had opposed prosecution at first, favored prosecution last week). This week, even more Americans support prosecuting him. The only groups not clearly favoring Snowden’s prosecution are those under 30, liberals and political independents. Those groups are evenly split, or narrowly opposed. Despite the changing opinion of Snowden, Americans remain opposed to the NSA’s activities. By 55% to 28%, they say the surveillance was an unnecessary intrusion into American lives. They remain divided on whether the surveillance has prevented terrorist attacks. And they continue to believe that the NSA, despite its claims to the contrary, has listened in on the conversations of Americans.